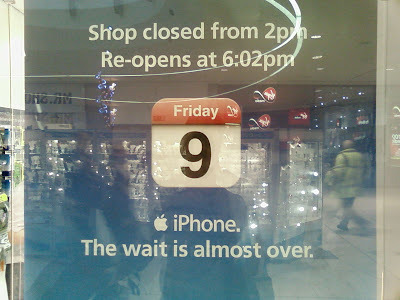 At 6.02pm today Apple's iPhone went on sale in the UK. Exclusively supplied on the O2 network the launch was co-ordinated so that all sales points started selling it at the same time. 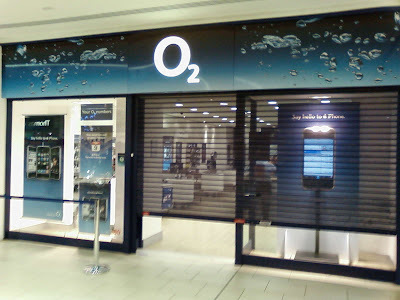 Carphone Warehouse, O2 and Apple stores all stayed shut this afternoon, before re-opening at 6.02. The photos below are from Lakeside shopping centre in Thurrock, Essex. 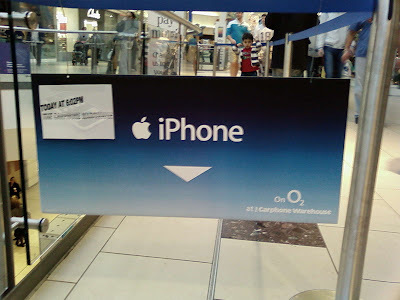 Iphone has already changed the UK mobile market. 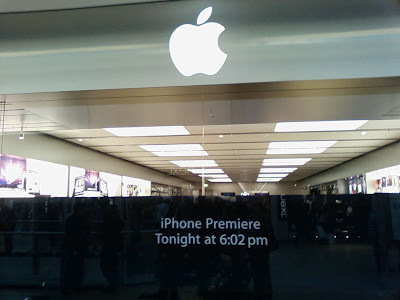 iPhone will see consumers re-evaluating the value that they attach to their mobile devices. In the UK market people have expected a new, free phone every 12 months, and going from a free phone on a 12 month contract, to a £269 phone on an 18 month contract is a big jump / big commitment - however it appears that a significant number of people are prepared to do this. The Nokia N95 restarted the principle of people paying for a handset, but the iPhone is the product that will really see people start to value their mobile phone again. Nick Burcher writes: "Hype and discussion around the iPhone has boosted public awareness of the mobile internet. Whilst operators like T-Mobile and Vodafone have pushed the mobile web, the iPhone is the device that has really raised awareness and changed perceptions of the potential of the mobile internet. Iphone is exclusive to O2, but could have positive implications for all UK operators if it's presence boosts UK mobile web usage." Interested to hear other peoples thoughts!